We had intended to return to Kandy for a couple of hours day visit after our morning at the elephant sanctuary, so this delay definitely did not help things. 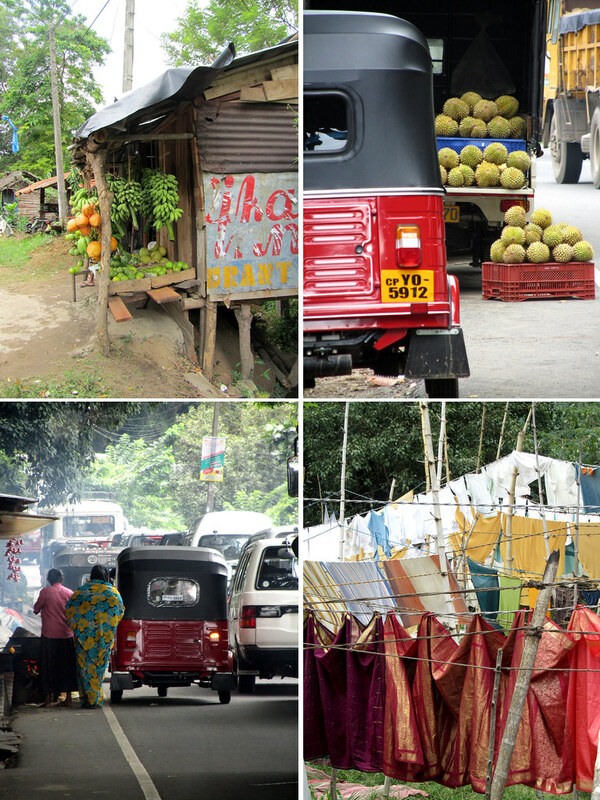 Closer to Kandy, we encountered another heavy traffic jam of vehicles trying to enter the city. It also started to rain rather heavily. We could see it was pointless for us to sit for another couple of hours in the traffic to make that final few kilometres in to Kandy (yes, traffic can be that horrendous) and not even be able to walk around as initially planned. Alas, it was also a good time to stop for lunch, so that became our new plan. Lunch, then off to the tea hills. The dry weather that we’d been enjoying so far seemed to have deserted us that afternoon. 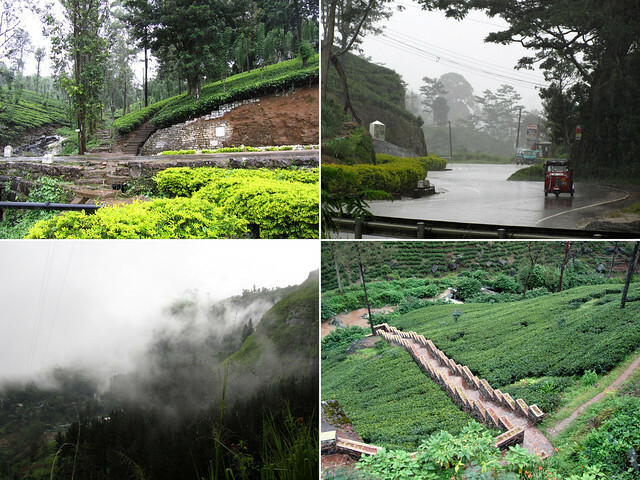 It continued to lash down while Nilan drove the windy road of the hills, and all we could do was huddled up by the window and looked out longingly at the tea plantations that came into horizon. We knew our chances of properly visiting any of them would be slim, and there went my romantic notion of photographing tea pickers among the rows and rows of tea plants. Bummer. Claire had a rougher time on the road in comparison as she was also not feeling well after developing intolerance to some spices in our lunch. When we finally stopped at a plantation for a short visit, the earlier downpour had turned into drizzle. Obviously a walk among the tea plants was out of question but we were taken on a short tour to learn about tea picking and processing in the factory. It was fairly interesting and the scent of the processed leaves was rather heady. And this, coming from a non-tea drinker. We had a short walkaround the tea house and its garden, but that about sum it all to this part of our excursion. 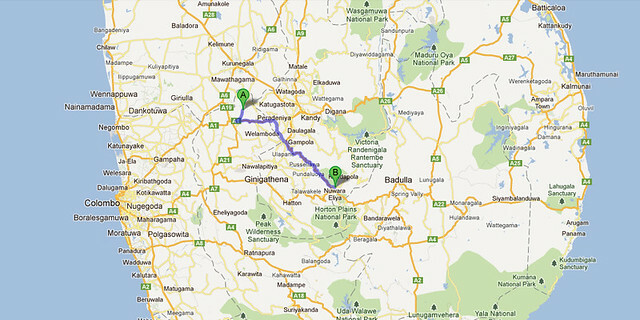 Arriving in Nuwara Eliya, Nilan told us he knew of a place we could stay at a budget price. Thinking “why not?”, we let him called the shot for a change. We were not feeling particularly motivated at that point to run around looking for a place after being confined to the inside of a van for hours (imagine if this had been a crowded bus – shudder!) and it was started to get dark too. At first glance, the room we were shown was alright. Not great but it was cheap-ish (Rs 3,000 so about €20) and not wanting to make too much fuss while thinking it could be nice that Nilan got to spend a little time later on with his friends, we agreed to take it. But first we needed to get into town to get dinner. After we put our bags down, we went right out again. It was completely dark when we got back even though it was just after 7pm. We were still trying to get used to the early nightfall, although we agreed for this occasion, it would be good as we wanted to depart early the next morning in order to make it to Horton’s Plains in good time for a couple of hours of morning trek. We tried to settle in for the evening and that was when we realised we had trouble in hands to solve. Bear in mind that for a change, we were in the hill countries and therefore the temperature were cooler than anywhere we’ve been so far. Not a problem. Temperature hovering in mid-teens was pretty much a typical European autumn weather anyway. However, you didn’t want a room with draught either. And that was what we got. Not only that, our beds were also damp. We could handle cold, but draught plus dampness and no sign of heater anywhere in the room was baaaaaad. Communication was a problem. The innkeeper insisted that it wasn’t dampness but the chilly temperature making the sheets cold and felt wet to touch. We knew otherwise. We knew what cold sheets are like and that wasn’t it. We enlisted Pras to try to talk to them given our Sinhalese was non-existence, but there was little that can be done. There were no other rooms that were improvement to what we’ve already got, and it was rather late to try to search for something elsewhere. At least not without risking going over budget. The best solution that the innkeeper could offer then was to take the sheets away, iron them (they still insisted it was just cold sheets and not damp beds) and remake the beds for us. Not an improvement even after that I’m afraid. Claire and I spent the night in layers of clothes and still we could felt the dampness seeping through. Never had we been so glad when morning came and we could leave, even though it was barely 6am. It was all rather unfortunate that between the rain and the sub-par lodging that our impression of Nuwara Eliya wasn’t as shiny as the other cities were. And we learnt a lesson that day too – we should have left to search for an alternative hotel for the night. Lack of a good night sleep was a major fond memory killer to our visit of Nuwara Eliya, and in return we judged the city harshly as a place not to remember fondly of. This is never a good thing for any travel excursion.